Hill Laboratories is a RLP accredited laboratory with a wide range of tests to support the fishing and aquaculture industries. 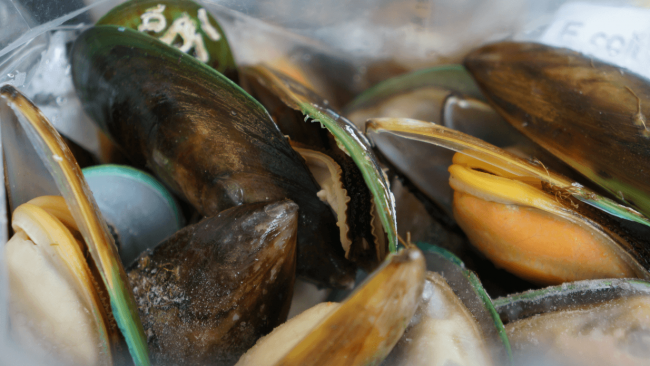 Fish, Shellfish (such as mussels, oysters, clams) and even seaweed are tested for compliance against domestic and/or export requirements. Commonly conducted analyses include chemistry testing for Maximum Residue Levels (MRL’s) particularly heavy metals, and Microbiological testing to ensure food safety. Water may become contaminated with heavy metals for many reasons. Many soil contaminants, such as heavy metals remain in biologically accessible states for extended periods of time, and are water-soluble, which means that they can bio-accumulate in fish and shellfish and potentially humans. As such testing soil, water, fruits and vegetables for heavy metals is commonplace. Hill Laboratories has an extensive suite of heavy metal tests for use on everything from soil through to honey. Our technical notes will help guide you through what test may be right for your needs, or you can always call our friendly Client Service Managers who will be happy to help understand what test options may best fit your situation. Hill Laboratories has an extensive array of pathogen-related tests that using either traditional culture, or molecular based detection. Our turnaround times are industry-leading and can be used with product or environmental swabs alike. Some of our routinely analysed pathogens are listed below, however for a more complete listing of our pathogen testing options and the associated test details, simply call us or complete the form below and we will be happy to help you decide what test is best for your particular needs. Hill Laboratories has extensive experience in the analysis of pesticide residues. We have developed award winning purification systems that ensure the best possible extraction of contaminants across the most diverse array of sample types available in New Zealand. Our test offering is IANZ accredited and suitable for use in both domestic and export-based situations. A complete listing of available pesticide test options can be found in our easy-to-read technical note documents.